If we lived in a world where PC cases could qualify as a work of art, this sucker would be on display at the MoMa. If you're looking for a computer case which offers easy transportation, sturdy craftsmanship, and stylish design, you're not going to want to pass up the Thermaltake SwordM VD5000BNA Case. Creating a masterful blend of artistic design and stunning technological advancement, this Thermaltake case is guaranteed to take your system to the next level. 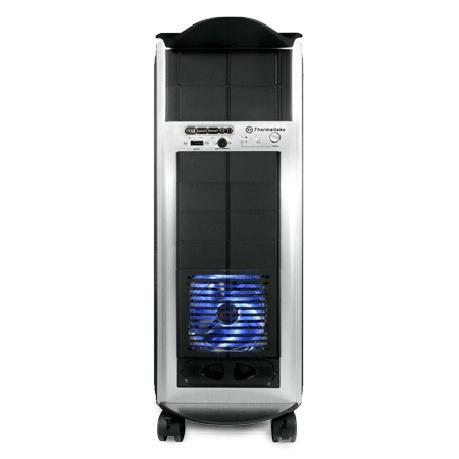 Fully handmade, this fine-tuned, multifunctional PC case is built with an all aluminum extrusion built chassis that's made to handle heavy duty usage. Tailor-made with the gamer in mind, the SwordM features a convertible top panel for enhanced ventilation, as well as a revolutionary open back plate design that provides a serious amount of internal air flow. In addition, the Thermaltake SwordM VD500LBNA Case comes complete with hydrualic mechanisms for the top and side panel, a detachable HDD cage, cable management, and reinforcement handles for easy transport. To sweeten the pot, the case even offers a refreshing tool-free design, making the SwordM incredibly easy to install. If you're ready for a serious jolt of gaming power, this embedded monster is the ultimate way to start your next major mod. Material: Aluminum Dimensions: 25.6" x 9.4" x 30.3"